Now that the weather is starting to warm up, and the clocks go forward on Sunday morning, Spring is well and truly on its way. It’s time to have a refresh of your wardrobe and find out the trends and must haves for this Spring. Put away your thick Winter coats and head out to see whats on offer this season. I’ve always been basic and comfy when it comes around to buying clothes, but always try to put a little effort in. Jeans – Jeans are a staple for every wardrobe, I’m a huge fan of the skinny jeans at the moment to slim down my legs! Boots – There is still a chance of fairly heavy showers in Spring so a good pair of boots teamed with jeans is always a good choice. Jacket – It may be too warm for Winter coats but a jacket is still a must. Why not try a Bomber Jacket for Women? Practical and still warm enough for chilly days. Long-Sleeve Tops – It’s not quite warm enough for vest tops and short sleeves, so stock up on some pretty long-sleeve tops for those in-between days. So what are the trends this Spring from the catwalk? Over the years I have always enjoyed looking through the latest fashion magazines to see what the models are wearing. More than likely I find something that makes me laugh and cannot believe that they are actually wearing that! Shoulder Pads are back!! That wonderful (cough cough!) 80’s fashion statement has returned to the catwalk. Sheer – oh dear, see through trousers anyone? Pink – more of the fuchsia shade. Sleeves – big oversized sleeves, ideal for drooping in your coffee when you are trying to have a sip! Bralettes – only for the smaller ladies who love to wear underwear as outer wear! Stripes – no need to say anymore. 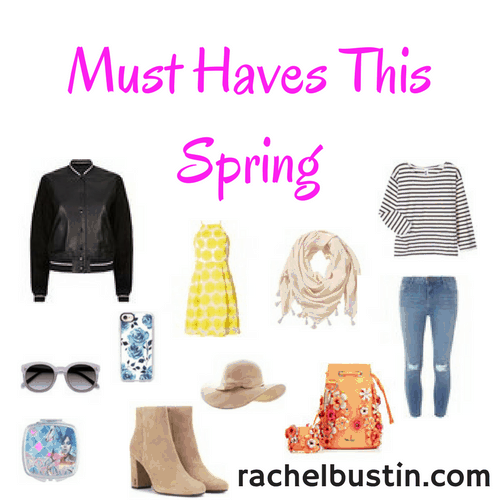 What are your Spring must haves for your wardrobe? As always I love to read your thoughts.